Infestations are a random event and are big threats. Insect hives spawn in an area below an Overhead Mountain and within 30 tiles of a colony structure. Other factors such as rock walls and light have some influence on their spawn point of choice. Temperatures under -8°C gradually reduce the spawn chances, with the chance dropping to zero at -17°C. A well-lit base discourages insects from nesting, though it can still happen. If you bait insects to spawn elsewhere the chance of an infestation spawning inside is greatly reduced. Neither heat nor floors have any bearing on hive spawning. If the hives are kept intact, they will reproduce progressively. If all Megaspiders or Spelopedes are killed, the hives will deteriorate due to lack of maintenance. Insectoids (Megascarabs, Megaspiders and Spelopedes) will spawn near hives to defend them, attacking and chasing any intruder within a radius of 30 to 35 tiles and returning to their hives once the threat is gone. They will also randomly dig at rocks to expand their hive. Infestations are most threatening in mountain bases, as they can spawn practically anywhere inside your base. They are much less harmful in other bases though, and can be considered as a normal-level threat there. 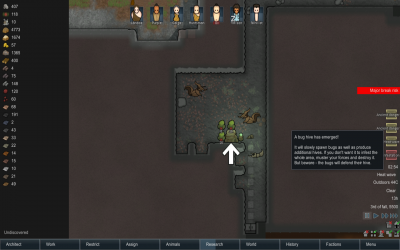 Insectoids are melee fighters so colonists with ranged equipment can try to kill them from a safe distance. When fighting an infestation always ensure you completely annihilate every hive. If even one is left, insectoids can keep spawning and leave you back where you started. Hives spawn insect jelly in stacks of 20 units every day or so. You can farm these by building walls and doors, but insects may dig out and attack your colony. You can retrieve the jelly when the insects are asleep. Another product glow pods that light for 20 days (as long as they’re installed). These can only be reinstalled should the hive be destroyed in version stable 1.0. This page was last edited on 11 November 2018, at 00:33.